Quebec's premier has criticized the manager of an Adidas store who reportedly told a Montreal crowd he would say a few words in French at an event to accommodate the city's francophone media. 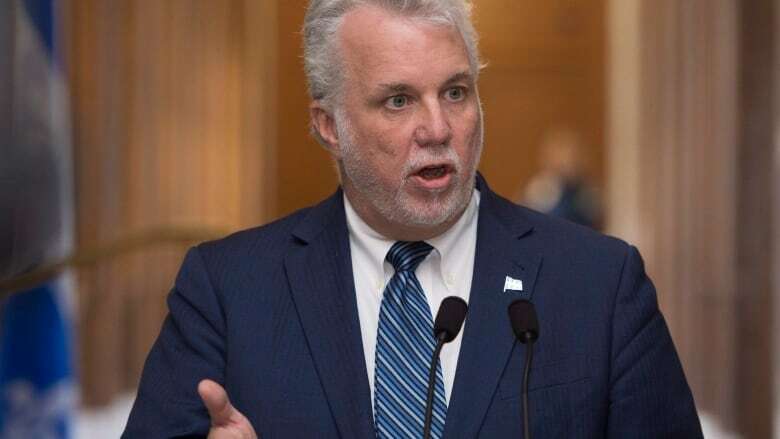 The manager's statements, if true, are unacceptable and regrettable in a French-speaking province, Philippe Couillard said in the National Assembly Thursday. "I will say very firmly that if the words we read this morning were pronounced, they are unacceptable," he said during question period. "The signal from business leaders must be clear. The workplace language in Quebec is French." Couillard's response was the latest in a flood of reaction to the comments since Le Journal de Montréal first reported them Wednesday. The newspaper said Alexandre Des Roches told the crowd at a store launch event he would begin his speech with a few words in French "to accommodate the City of Montreal and the francophone media." He then switched to English, Le Journal reported. During question period, Parti Québécois Leader Jean-François Lisée blamed Couillard for the incident, accusing him of having promoted the use of English in the workplace. "This is the result of four years of signals from the premier which said: 'The important thing, it's that everyone in a factory speaks English in case someone asks a question,"' Lisée said. Couillard replied that while English speakers are an important part of Quebec society, the language of the workplace is French. Montreal Mayor Valérie Plante also reacted to the manager's comments, calling them a "blatant lack of sensitivity." "[It's a lack of] respect toward the fact we're in a French province, and the metropolis is also francophone," she said at a news conference with Quebec City Mayor Régis Labeaume. Labeaume was more blunt in his comments. "I find it scandalous, especially since [Des Roches] is a francophone," he said. "I can't believe it, he must really be colonized," he said, adding he would never shop at the store. The linguistic spat also drew a wave of responses on social media, with some, including TV personality Guy A. Lepage and former PQ leadership candidate Paul St-Pierre Plamondon, vowing to boycott the activewear company and urging others to do the same. Adidas did not respond to a request for comment.